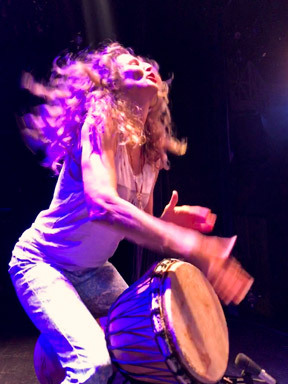 Sophie B. Hawkins is a Grammy nominated, American singer-songwriter and accomplished musician with more than thirty years in the music industry. Hawkins's debut album, Tongues and Tails, released in 1992 achieved both worldwide commercial success (certified Gold) and critical acclaim, earning her a Grammy nomination for Best New Artist and six New York Music Awards in 1993. The single "Damn I Wish I Was Your Lover" spent months in the top ten on the Billboard singles chart in the USA and in the UK. Hawkins covered Bob Dylan's "I Want You" on Tongues and Tails and was invited to perform for Bob Dylan's 30th anniversary at Madison Square Garden. The concert and the corresponding album included Neil Young, Eric Clapton, Johnny Cash, Lou Reed and Willie Nelson. Hawkins' 2006 Bad Kitty Board Mix was recorded live in at The Triple Door in Seattle and at The Basement in Sydney, Australia. It captured the vibrant energy and intimate storytelling that fans love about Hawkins shows. In 2012, Hawkins released The Crossing that included “The Land, The Sea and The Sky.” The video of which documented her direct participation in the clean up of the BP oil spill in the Gulf. She donated and continues to donate all the proceeds from the song to The Watershed Alliance, a non-profit organization that works to keep the Earth’s water clean. “Dream Street & Chance” was just one of the jazzy, modern torch songs that defined the album. She also starred as Janis Joplin in the play Room 105. Critics praised her performance and wrote “it was a part she was born to play.” The following year, Hawkins starred as herself and performed on the TV series Community. Her music has been featured in classic films such as 40 Days and 40 Nights, Bounce, New Years Eve, Mrs. Winterbourne, Now and Then and The Associate and major television shows such as The Blacklist, Dawson’s Creek, Party of Five and Northern Lights. After moving back from Los Angeles to New York, Hawkins authored her own play with original music and is working on its production. She has written and recorded new music to be released in early 2019. Hawkins has been a steadfast supporter of women’s rights, the LGBTQ community, animal and environmental protection throughout her life and career. ** "Meet & Greet" available for an additional $30 per ticket. Use the dropdown menu to choose "Ticket + Meet & Greet." - Exclusive opportunity to meet Sophie B. Hawkins in person and receive a personalized, autographed 8"x10" photo OR a matted, autographed limited edition print of one of of Sophie's paintings.